Last fall I received a phone call from a girl that was studying at UT and needed a summer internship with a non-profit. She had to get school credit for it, which I thought I could pull off, and make us look legit enough. Carly and I spoke on the phone and agreed to meet at a coffee shop in Dallas on her Christmas break. In typical fashion, Carly had to call me and REMIND me that we were meeting as my scattered brain was everywhere during the holidays. But this May after college finals were over Carly began working for us. And it was like nothing I have ever experienced before! I could call Carly from whatever city I was in and she was right there able to deposit checks, or respond to emails that Arise Africa was receiving. She could shop for our mission trip and she was so efficient. Heck she even took care of my personal life and let the dog out for me when I was out of town and kept up with my schedule reminding me where I was supposed to be and what we needed to get finished. It was like magic! Then Carly began to organize our school supply drive where teachers around Dallas (and my ever loyal Houston teacher friend Kate) gather up all their extra school supplies and donate them to us when school ends. Carly even made a fancy flyer to pass out to the elementary schools. I knew she was good but this put Arise Africa on a whole new level! She called principals and organized placing trunks in the hallways of the schools as teachers cleared out their rooms. This trash to USA schools is like gold in Africa. We collected hundreds of pounds of crayons, markers, pens, pencils, paper, posters, and children’s books. ALL of which Carly collected, organized and delivered to my garage. I couldn’t believe it; I had NOTHING to do with the school supply drive this year and it was a major success not to mention much more organized. 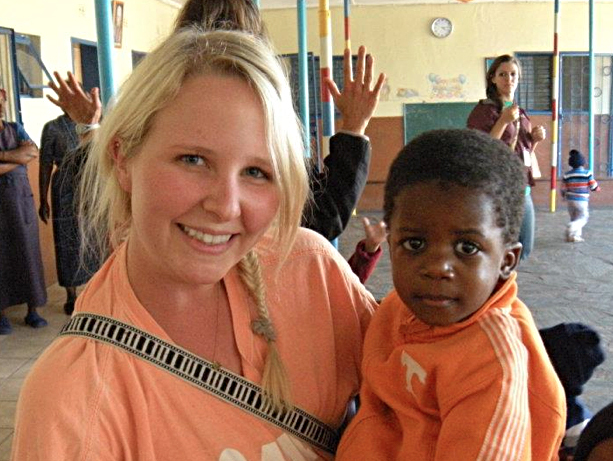 I am not sure I would have made it to Africa in June without Carly’s help in May. And for that matter I am not sure any other mission trip participant would have either. She packed and weighed each of our donation bags, dealt with last minute airline changes, bought and booted up two brand new computers for Africa, and listened to my absurd ideas on how to pack the desktop computers. (They made it without any damage!) And most importantly Carly ran behind me cleaning up my messes, and there are a lot! She watched where I would put my keys when I was at the office or when we were packing in our garage and right when I was about to loose my mind trying to find them she would politely tell me where I had placed them. Once again, magic. In June we headed to Africa. And once again Carly was up for doing anything. The first week Carly was there we were having a training week for Zambian teachers with our American teachers. One of our Zambian teachers arrived in typical African fashion with a baby strapped on her back. Elizabeth has been taking care of this child who has no parents. Carly selflessly helped Elizabeth take care of Mapalo (means blessing in their language) so that Elizabeth could attend the class. Carly sat outside of the class and loved on this kid! Every day when I would arrive at the training she would be holding that baby and entertaining him. We found out that Mapalo loves the Beatles thanks to Carly’s iphone. He also likes hard-boiled eggs and watching other kids so Carly found a playground and would sit on a bench while he watched kids play. Mapolo was not easy to take care of and yet everyday Carly took care of him, never ever complaining. Carly spent the rest of her time in Africa loving on other kids, and of course running after me helping remember where my car keys were or other important things like my backpack with my computer. She took care of writing the blog every night which is the last thing I want to do when I am over there. She stood up and handled things I didn’t even know I needed help on. She took a group of kids during our Bible camp week and loved on some of the smallest ones. This is not easy to do day after day. Carly also introduced all of us to the card game, Nertz, which pretty much has changed our mission trips forever. The intense card games that were held every night were pretty epic. Between eating brownies and Choc Kits, watching out for rats, and playing Nertz our evenings on mission trips are rather entertaining. (Yes I am sorry for future mission trip participants, there are rats in Africa) We also discovered Carly has a very strong love for elephants and anything elephant related. We noticed she might have a bit of an issue that might require a therapist at the local souvenir market when she purchased just about anything elephant she could find. And there is a lot of elephant paraphernalia let me tell you. It was like watching a kid in a candy shop as she bought every wooden elephant possible. Carly got to go to Victoria Falls where she RODE elephants! And this was a lifelong dream for Carly. From my experience I thought the elephant rides stink, and of course very vocally informed our group to not waste their money on it. They walk you through the area where they eat off the trees so everything is gone and you walk for like 20 minutes and it is boring. It is like riding a fat horse in my mind. But nobody listened to me (thank the Lord once again) because the elephant rides have changed since my last experience (which was 2006). Not only did our group ride for two hours on elephants but also got to feed them and pet them and hang out with them afterwards. Carly was in absolute heaven. She even enjoyed learning about the elephant shi* on the game drive. When we got back from Africa Carly probably had the worst job ever, moving our office in the month of July, in Texas. Carly helped me pack up our old office and drag our stuff across town to our new office. This took many trips in our cars, because people we are a non-profit we don’t hire movers. With the help of another mission trip participant, Madeline, they completely set up our new office. It was incredible. And it looks GOOD! If I had done it everything would still be in boxes except my desk and a chair. But we look legit and even decorated, like with stuff on the walls! I realized without Carly I would have to start to keep up with my own stuff and actually pay attention. I would have to fill t-shirt orders myself and so many other jobs she did, the load was back on me. We had a fun party at a friend’s house and I thanked Carly for all she did. And I also gave Carly her going away present for working with us for the summer. If you don’t know what that is in her hand that is a paperweight with elephant crap in it that I bought at the local market in Zambia! Carly thanks for ALL your hard work and I miss you already! And do you know where my keys are? !